Click the image for Molly's NEW fan page! Molly's Story on DVD is now available! Copyright Notice: The Owl Box, The Owl Box 2, Molly The Owl, Molly The Most Famous Owl in the World plus all content is copyrighted by Carlos and Donna Royal: that includes all audio, video, written material and photographs. No redistribution or commercial use of any kind without written permission. Screen shots are copyrighted material because they are in effect a photo/digital photo of copyrighted material. Advisory: This is a live feed of a Wild Barn Owl and family. Owls are carnivores. They hunt, kill and consume small rodents and other small animals. This is nature and contains scenes of the cycle of life which may occur at any time without warning. We do not control the weather or what happen in this owl box. It is Nature and our policy is to let Nature take its course. The Owl Box is located in San Marcos, CA. Barn Owls are about 14 to 16 inches tall. Incubation takes 30 to 34 days. Owlets hatch in order laid. Molly and McGee have successfully fledged 10 owlets. The male has a white chest and face, while the female is more camouflaged and rufous in color with spots.. The male usually shows up after dark. We have named the female Molly and the male McGee. The Barn Owl is widespread and can be found in most parts of the world. 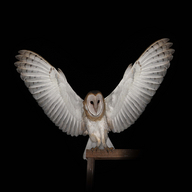 They are mostly nocturnal and rarely observed in flight during daylight hours but light does not hurt, harm or bother barn owls. They are often seen looking out during daylight hours on bright sunny days. The Owl Box is located on a 15 foot pole next to a mimosa tree just outside the entrance but rarely do the owls or the owlets land in the tree. They seem to prefer structures like tall poles, old buildings or fan palm trees. It took two years for an owl showed up in our owl box but owls can show up almost immediately. No other birds have tried to nest in the owl box. We have a very eco-friendly backyard; we live on an acre lot with lots of trees and plants for wildlife. We have had kestrels, bluebirds, hummingbirds, phoebes, wild ducks, killdeer, and mockingbirds all nest and raise their young in our habitat. We do not have any cats or dogs to disturb the wildlife. We have identified 58 different birds in our backyard. Sign up for tweets and follow us. Lisa Nichols's SPEAK & WRITE TO MAKE MILLIONS!